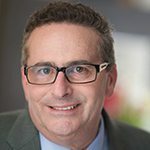 Keith Halperin of Korn Ferry speaks with Evan Hackel about approaches to Leadership Development. 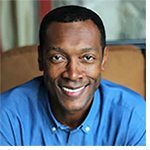 Keith is a Senior Partner at Korn Ferry and has been designing and conducting programs to enhance the leadership skills of managers and executives worldwide for more than 30 years. Evan: We’re thrilled and delighted to have with us Keith Halperin, he’s a senior partner at ‎Korn Ferry. As I do with everyone, just, you know, tell us a little bit about your background, tell us a little bit about Korn Ferry’s background, particularly ‘cuz I think most people don’t quite understand how big a company Korn Ferry is in the training space. Keith: Right, yeah, absolutely. 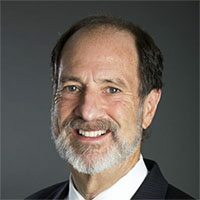 Korn Ferry is over a billion-dollar organization, probably most of you know Korn Ferry as a search firm, and that is about a third of the Korn Ferry practice. We’re really interested in the whole leadership development space including identifying effective leaders, then the search part of our business, and we have a large part of the business that is leadership training and consulting and building the bench strength of leaders in organizations. And I’m part of the practice, I don’t do search I’m part of the organization that works with leaders to improve their confidence and their leadership skills. Evan: Sounds fabulous. So why don’t we just start there with leadership. 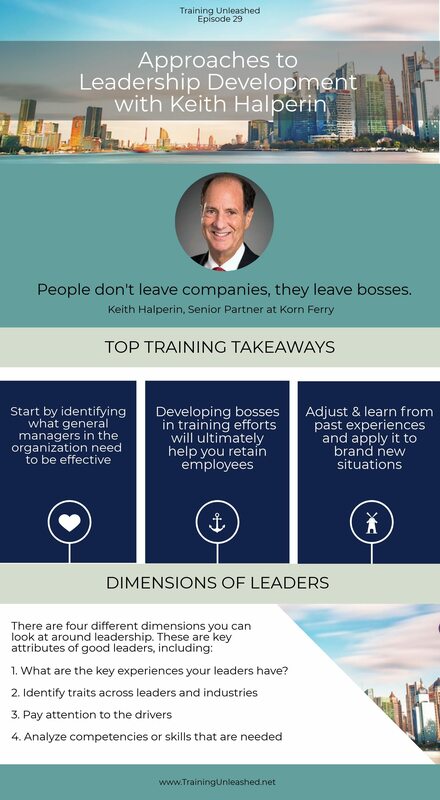 How does Korn Ferry develop leaders? Keith: Yeah. Number of ways, and I think some of the things that we talk about that may differentiate us in terms of that leadership development space is really taking a very holistic approach in thinking about how you develop leaders. Our belief is that training should not be a single event, but really, development is a journey and training is a part of that journey. And it also has to be done within the context. It’s not good enough to just look at specific discrete skills, but then how do you really think about what does that business need, what could the leaders need in that business, and how do you build that leadership journey that links to what’s important to them, and where they have a chance to apply those skills and experiences right on the job. So we look for those development opportunities that involve training, that involve experience, that involve immersion, and it all comes together as a whole cloth for development. Evan: Could you share some examples of some of those type of things that you guys do? Keith: Sure. Well, one example, for instance, is an organization we’ve been working with for a number of years and we’re looking at high potential people that would be moving into the general manager ranks. And the general manager job is a real pivotal job for this particular organization. So they’re putting special emphasis on that group. We really started by identifying what do effective general managers in this organization need. And then after we did that we developed an assessment tool to assess these high potential leaders. And the program included that assessment tool and feedback from the assessment. From there we moved into training modules around those critical skills. Then we built what’s often called action learning projects, where teams would have to work on a real-life issue back in the organization over a 12-week period. In the middle of that 12-week period, they went through an immersion program. One of the things this organization was focusing on is building up their business in emerging markets, so this group went to an emerging market and spent two days in that market, learning about that market, understanding how business is done in that emerging market, and then bringing that back into the classroom. And there continued the training on what they learned and how to build that business, and they presented that out to senior leaders. So senior leaders got to hear their insights, their knowledge, their learning about leading in an emerging market space. So you can see how it’s a journey, not [inaudible 00:04:31]. And it’s linked to what the organization needs. Evan: I have a feeling that you made almost everybody jealous. You know, the issue of how do you get the support to make something like that really work. But I wanna highlight if I can at the very beginning of what you talked about because I do think personally it’s something that’s missed. And that is determining who the superstars are and benchmarking why they’re superstars. And really understanding that because a lot of times people move to, well, one of the skill sets, not what are the skill sets of the people and matching the two. And I really…I just wanted to point that out to everyone ‘cuz I think that’s really a great thing and I love the whole concept. And I’m gonna skip a little bit of our questions here, but how do you get an organization understand and value doing something that big? Keith: Let me answer that, then I wanna go back and say something about identifying people. Keith: But in terms of…you obviously need a champion inside the organization as you do in most kind of change initiatives. And I think you need to make sure that the development is linked to where is the organizational pain? What’s the need? Going back to that one example again, we were able to identify that the general management position was a real pivotal position for the success of that organization. And it took a lot of diverse skills to be effective in that position. They also were able to identify that a lot of general managers were moving into that role and not successful. So there was a pain point. And we were able to talk to the successful ones and all of them said, “We need to develop people earlier if we’re gonna be successful in moving them into that role.” So we got a critical mass of senior people in the organization say, “Here’s a pain. Here’s an important issue.” And then it was easy to back in and say, “Let’s look at how we can develop leaders to achieve that.” So again, who’s a champion? What’s the problem you’re trying to solve in the organization? What’s the pain? Show them that here is a way to help resolve that, seems to work. The other interesting thing, going back to your comment about identifying…because that’s always a challenge, “How are you sure you’re identifying the right people?” And this was an evolution in this organization because again, we did a fairly thorough evaluation and assessment as part of the program. But then we shared the feedback from that assessment with the people in the talent organization. And the very first time we did the program, we had some mixed results in terms of that assessment. And what we were able to do was use that assessment as a way to back into making sure they’re selecting the right people for that program. So then the second time and the third time we did the program the caliber people got better and better because there was that feedback loop the people they were selecting. Evan: What are the types of ideas you could share with everyone here on how to help, just sort of the overall organization be more effective? Keith: I think that in terms of the overall organization…and again, our focus is mostly on leaders in the organization. And we look at leaders in four different dimensions around leadership. There is experience, and what are the key experiences that those leaders have? And how do we help people in leadership roles throughout the organization get some of those critical experiences that they need? We also look at traits. And be able to identify and I believe there are some common traits across leaders that they need in order to be successful. So we can look at what are those common traits across leaders, across industries? And that may be a way to help leaders throughout the organization be successful. We also need to pay attention to the drivers. As you probably know leading is hard work, it takes a lot of energy, it takes a lot of passion. And so to try to understand do those people really have the drive to really wanna do it or are they doing it because they’re told to or it’s the next step on the ladder? So I think it’s important to help organizations look at those factors as well. And then finally looking at what are those competencies or skills that are needed. So thinking about helping them identify the right experiences, what’s the style or personality that’s critical across leaders, the drive to be leaders, and then the competencies. If we can build programs to help organizations do all of that, then I think we’re upping the game for all leaders. Evan: So what are those…just share some of those key attributes of good leaders from your point of view. Keith: Yeah. One of things…a big thing that we’ve done a fair amount of research in this area as others have done is for instance, learning agility. Because leaders moving into new situations often, moving into the unknown and into uncertainty and ambiguity need to be able to adjust, they need to be able to learn from past experiences, but then apply that in brand new situations. And for instance, again, we have some methodology to assess learning agility and then to teach it. And then to help leaders be able to become more flexible, more agile, more able to handle these first-time situations. So that would be certainly one example. Other things that we know are critical around leadership is building a high level of trust with the people that you’re leading. And ways of doing that certainly in today’s world, innovation, creating a culture for innovation is important. And being able to lead change with everything going on is important. So those are some of the examples of some of those key competencies that we could train around and really build leadership skills. Evan: You’ve said some things here that I think are really important, because when I think of your company…and I have a very good friend by the way that works in your training division. So I know your company from him and tremendous respect. I don’t think people really quite understand the depth of the research that you guys do and that expertise that you bring that other people just can’t duplicate because you don’t think this is the right thing, you know this is the right thing as you do the research. And maybe talk a little bit about how you go about doing that and the depth of the work you guys do to learn. Keith: Yeah, we have…I’m a PhD psychologist and we have, you know, probably more than 300 PhDs in our organization. It kind of feels like a mini-university at times. And we have a part of the organization, is a Korn Ferry Institute, and that’s the institute that does a lot of the research. And what’s nice about it is we’re able to really take applied situations and put some rigorous research behind it. So for example, part of our business is assessing leaders, again, not in the search part of the business but in the leadership development part of the business. We do psychological and business assessments. We see more than 10,000 executives a year around the world. And what we do with those assessments is we’re able to then mine the data, and we’re able to go back to the organization and get some criterion information about success. We can then look at the data and then from all of that pull together what does it really take for leaders to be successful. And so we’re fairly confident that we’ve got great depth of wisdom because all of the information that we use we will then turn into research information, and of course it’s confidential because it’s gathered in group settings, but we know what makes for effective leaders. We just put together a brand new survey, a brand new psychological test for leaders because of all of that research we’ve developed over the years. So we continuously improve and continuously up our game in terms of both training and assessment. Evan: Well, and I think it’s fabulous and kind of interesting ‘cuz as your business grows you just keep learning more and more. Which is fabulous. I want for a moment here for you to talk about maybe the changes you’ve seen in the world of training and maybe a little bit about what you think might be coming down the road. Keith: And what I didn’t say at the beginning is some of the things I see in terms of changes in training, things that we’re trying to do. You know, it used to be I remember years ago I was working with an organization, we had a 13-day in a row training program. If you think about GE way back when in Crotonville, and it’s still at Crotonville, but they would have two-week long programs at Crotonville. My sense is the time of the two-week out of the office training program is probably almost over if not totally over. Evan: I need to tell you it’s not over as you think it is. And it’s very typical for us when we see clients and such is to say now you’ve gotta break this up and it’s just too much to expect. But there are so many companies out there particularly…’cuz our area of specialty is franchising which is a little different. There are a lot of franchise organizations that start with two or three-week onboarding and starting programs, and it’s overwhelming for people. But, you know, I agree with you completely. It’s too much. Keith: Yeah. And I think a lot of organizations are finding that, and particularly at that leadership level. So I think that part of what is changing and what will probably continue to change is one chunking the programs, that’s a technical term if you understand it. Evan: It’s not a soup? Keith: Yeah, it’s like soup. Much better than just broth. Chunking the programs into those small modules, one example out of a number of examples where we do that, we’ll have instead of one, two-week program if we’re able to get that much time with our participants we’ll break it down into three-day or two-day modules. Also the importance of learning on the job and at work, but have that learning be guided. You always hear that comment about most of the learning happens on the job and probably familiar with the CCL 70% of the learning happens on the job, and 30% through training programs. I think that’s true but I don’t think that just by having experience people learn. I think people need to reflect on that experience and they need to get some coaching in order to learn from that experience. In fact, they find a difference between 22% learning if you just get thrown into an experience versus an over 80% learning if there are some coaching, or development, or guiding around experience you’re having. So I think chunking, I think then having appropriate experiences on the job with some facilitation, with some guidance, with some coaching so people can really grow from those experiences. And having kind of multimedia approaches, so probably things that are happening will continue to happen. Online learning, not just online learning but blending online learning with classroom, with on the job experiences, all with the result of clear people doing their job better and you can see it. Because they’re working on projects on the job. Evan: I’m gonna ask you a really tough question now. Sometimes in organizations, the learning on the job fails because the people that are there now have the wrong attitude, have been poorly trained to have the wrong habits, how do you deal with that? Keith: In this type of leadership development context? Evan: Yeah, or in any. I mean, you know, you’re working with a company and they, you know, maybe the term might be culture change, might be the right term for this. But where it’s not just who you are teaching and bringing in, but you have issues with the people there. Keith: That [inaudible 00:19:08] they’re in the organization. Evan: Organizations that have bad habits that, you know, you don’t want them to do that training because they’re gonna train people, not in the right way but they’ll make them many negative, not productive people. Keith: Yeah. And I think if I understand you right, I remember really getting caught up in that because I was working with a group of participants and of course I was asking them to go back to their boss and to get some information about X, Y, and Z. And when they came back the next time I discovered that they didn’t do any of that or the people who tried it that’s defunct. Then I discovered, oh, well, you can’t provide the training out of context and then throw back in that same dirty swimming pool and expect that they’re now gonna be clean and not get any germs. So I think it really is important whether it is the trainer or someone else who is a champion in that organization to work with the people around the organization to provide that support, to ensure that they know what the outcome is of this leadership program, what the expectations are, and what their role is in supporting. Often times I’m able to do kind of executive overviews. I do the overview for the executives of here’s the program, here’s what’s going to happen. And then we spend some time, say let’s talk about what your role is in this process. There are times where I’m able to coach executives one on one. So we’ve got a group of participants and I could talk to the executive about their role, about the participants, about what’s gonna happen. So having that one-on-one coaching, likewise, if we do action learning projects and there’s an internal sponsor that’s working on that project, it’s really critical for that sponsor to get coached on, what’s your role as a sponsor? What you should be doing. How are you gonna support this team that’s going through this action learning assignment and project? So yes, that somehow make sure you’re touching people outside the classroom. And the last thing around that that I try to do is to make sure that whatever we’re trying to teach or promote in the classroom can be done by those folks without getting permission. So as long as it’s skills that they can learn, it’s a style they can adapt but they don’t need to go back and ask the organization, “Is it okay to do this?” Then you have a better chance of being successful than if you’re teaching something that they have to go back and then get permission to implement. Evan: Yeah, that makes complete sense. Get the buy-in early, which is one of the toughest things. Sort of on this point, maybe slightly different. But one of the difficulties people have in training is ROI. How do you determine is it a good return on investment, and you know, always it’s so difficult because it’s not like your organization is frozen and the only thing you’ve changed is training. So how do you justify it? But, you know, when we were talking sort of in advance of this you were saying there are other ways that you can show a return other than a literal ROI. [inaudible 00:22:34] share some of those with everyone on the webinar. Keith: So one thing that comes to mind as I was working in organizations, I was working with some of the marketing folks and one of the marketing guys for this company sponsored a NASCAR. So they had the company’s name on the NASCAR and all of that, and I’m sure a lot of your listeners know that type of sponsorship. And I said, “Well, what’s return on investment for that?” And you know, he had no clue. Yeah, how’s he gonna have a clue? So there’s a part of me that feels that people in our profession feel terribly guilty that we can’t come up with an ROI, you know, financial ROI. And if we look at our brother in the marketing area, if we look at people in IT who give everyone new computers, what’s the return on investment of that new computer? “Well, I think they’re gonna work better.” How do you know that? Well, they don’t know that. So one is I think we need to be a little less guilty. But then second, in some ways do what those people who sponsored NASCAR and provide people new laptops will do. And then there are two things. One is to get stories. And a lot of times when I, again, do a major training journey, not a single event and people do things in between I get a lot of stories from them, “What did you do?” “What was the impact that you had?” There are times I’m able, you know, during graduation of these programs to get the senior leaders to come in and listen to the stories that the participants tell about the impact that the program had and they sometimes can put an ROI on it. I remember, this was just a couple weeks ago one person talked about influence in a different way after going through the program and then working with someone right afterwards where he believed he was able to save $700,000 because of what he did differently than he would have done prior to coming to the program. And he told that story to the executives who were around the room. So if you think about just a couple of people saving that amount of money it’s gonna be amazing. Also if you do action learning, those action learning projects that are part of development in the right context, you can see a result from those projects. So you can get ROI light from those type of stories. The other thing we have is a tool we call Time to Change. It’s a 360 tool that looks at behavior change. And we ask the participants first to identify, what behaviors are you going to change because you are here? So they make that commitment on behavior that they’re going to change. Then we go back three to six months later and we have their peers, their direct reports, their bosses, complete a survey that’s asking them what extent did you see a change in this person’s behavior and it’s behaviors they said they were gonna change. So we’re then able to go back to the organization and say, “Well, here’s what people said they were gonna do. And here’s what people felt they didn’t do.” So we get that level three behavior change. And through stories, you can get some information about level, the Kirkpatrick Level 4 ROI type of feedback. Evan: Those are really terrific ideas and I really like that idea of going back to people after and judging what they feel the change is. I’ll just throw out an idea from my side I think I use, which is a preassessment of people and their desire for change, for training. So what I find is that there are tons of people that want more training. So if you develop an assessment of the people and one of the questions are, do you feel you can improve your performance and work with training? Do you want training? Then you have this sort of proven demand that can make a difference. But I’m very impressed with the way you guys look at the world and see things, and jealous of your information to be quite honest. Evan: You know, we’re talking about [inaudible 00:27:12], you know, what it means. But one of the areas I think the training helps is retention, and maybe talk a little bit about that and the importance of that in terms of how management would look at training. Keith: Yeah. This is really true that management, senior managers will look at training as a retention tool. But it is, I mean, we know that it is. I mean, there’s been a lot of research that people, you know, the old Gallup comment that people don’t leave companies, they leave bosses. Developing the bosses and training will help the retention of their people. And retention is increased from the participants who go to those programs because you’re not gonna always get a promotion, you’re not gonna always be able to get ahead. And there’s been a lot of research, ours and others that say people want to be developed, people want to be paid attention to. If they feel they’re being developed, they’re going to stay longer in the organization, they’re gonna feel good about the organization. So absolutely, there’s data to support that. From the participant point of view, there’s certainly data to support that if we can improve the bosses through training that they will have more retention in the workplace. I was working in China a couple of years ago in Beijing where people were moving constantly because, you know, they’re gonna get another $20,000 if they move to this or get a title if they move from job A to job B. And it was interesting, one person came to me after a program and said, “You know what? I have an offer where I get a better salary, a better title in this company, but I felt so good that company X that I was working with took the opportunity to train me and to spend time with me and spend money on me that I think I’m gonna stay and not take that other offer.” So that, you know, it’s just a very personal example of, I think, things that are going on in people’s heads all the time. Evan: I wanna thank you very much. Keith, I wanna just end and say that I really enjoyed the interview, I learned as we went which is great. A lot of respect for you and a lot of respect for your company. And thank you very much for participating, we really appreciate it. Keith: Evan, thank you, I enjoyed it. Announcer: This has been Training Unleashed. But it doesn’t stop here. Just go to trainingunleashed.net to subscribe to the show. That way you’ll never miss an episode. And you’ll be well on your way to delivering training programs that are off the chain. We’ll talk to you next time on Training Unleashed.